NEW YORK TIMES BESTSELLER • For fans of Jacqueline Winspear, Charles Todd, and Anne Perry comes a gripping mystery featuring intrepid spy and code breaker Maggie Hope. This time, the fallout of a deadly plot comes straight to her own front door. World War II rages on across Europe, but Maggie Hope has finally found a moment of rest on the pastoral coast of western Scotland. Home from an undercover mission in Berlin, she settles down to teach at her old spy training camp, and to heal from scars on both her body and heart. Yet instead of enjoying the quieter pace of life, Maggie is quickly drawn into another web of danger and intrigue. When three ballerinas fall strangely ill in Glasgow—including one of Maggie’s dearest friends—Maggie partners with MI-5 to uncover the truth behind their unusual symptoms. What she finds points to a series of poisonings that may expose shocking government secrets and put countless British lives at stake. But it’s the fight brewing in the Pacific that will forever change the course of the war—and indelibly shape Maggie’s fate. 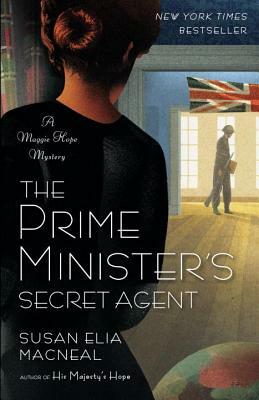 Susan Elia MacNeal is the Barry Award–winning and Edgar, Dilys, and Macavity Award–nominated author of the Maggie Hope mysteries, including Mr. Churchill’s Secretary, Princess Elizabeth’s Spy, His Majesty’s Hope, and The Prime Minister’s Secret Agent. She lives in Park Slope, Brooklyn, with her husband and child.